A while ago I posted a picture and some words about Huey P. Long, aka "The Kingfish." A cousin of mine was in a school production of Inherit the Wind, the drama about the Scopes Trial, sometimes known as the "Monkey Trial," a 1925 extravaganza about the teaching of evolution in the schools also a movie starring Spencer Tracy, Frederic March, and Gene Kelly. 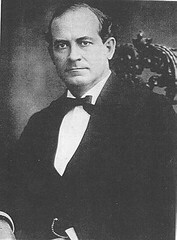 The trial brought together H.L.Mencken, who covered the affair as a cynical young reporter for the Bawlmer Sun; Clarence Darrow, the flamboyant Chicago trial lawyer; and William Jennings Bryan, three-time presidential candidate and former Secretary of State. Bryan's finest hour was his resignation, on principle, as the nefarious Woodrow Wilson's Secretary of State, because Wilson, having run for reelection on the slogan "He kept us out of war," promptly began maneuvering to get us into World War I. 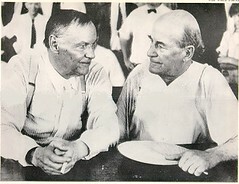 There's more about the Scopes Trial in a fine series of pages here. The "Inherit the Wind" version, although it does not make Bryan entirely unsympathetic, takes dramatic licenses and is a but unfair to Bryan. What's fascinating about all of this is that although the issues and symbols have changed, there's nothing new about the "red state"-"blue state' dichotomy, or the culture wars that go with it. Bryan, a flawed man, was nevertheless a giant, and quintessentially American. We should not forget him.